Cape Breton Tourism Spotlight: Arrr! Me Matey's, Pirate Days Be Coming Your Way, So Drop Anchor in St. Peter's and Join In The Merriment From September 16th. to 18th. Arrr! Me Matey's, Pirate Days Be Coming Your Way, So Drop Anchor in St. Peter's and Join In The Merriment From September 16th. to 18th. If you enjoy having a great time, getting dressed up as a pirate and hearing great music then you are in for a treat, comes to the St. Peter's Pirate Days from September 16th to 18th. It is going to be a full weekend of fun and merriment as the entire Village joins in the festivities. Events begin from 7 to 8pm on Friday, September 16th with the Opening ceremony "Pirate Ashore" at the Nicolas Denys Museum. Come and hear about the new festival and meet the Pirates of Halifax who are the special guests during the weekend events. The Pirates will the contest judges for best dressed store window and best dressed lawns and homes contests, and will be travelling through the Village during this procedure. So don't be surprised to see pirates roaming the streets of St. Peter's. The awards ceremony for the Best Dressed Store fronts along with music with Darrell Keigan and Stewart MacDonald will take place at the MacBouch Restaurant from 9pm to midnight. Starting on Saturday, September 17th, enjoy the Thieves' Market, with specials offered at businesses throughout the village, you will feel like a pirate getting such bargains. Also on Saturday the kids can join in the fun of Pirate Days with young scallywags activities at the St. Peter's Marina, including face painting, bouncy castle, games, scary stories and more with the Pirates of Halifax, taking place from 10am til 12pm - free event. Then the wee scallywags can travel up to Louie's Cosy Corner Restaurant and enjoy lunch with the Pirates, cost for the lunch is $6.00 and reservations are suggested for this event by calling 902-535-3195. A Pirate Patio Party with grub and grog for sale, and live music with Derek & Wayne Webb will take place at Jiggs from 6pm to 9pm. This is also a great viewing area to watch the Pirate Ships Parade from 7:30pm to 8:30pm. The pirate ships will depart the Lion's Marina and sail around Corbett's Cove, the ships will be competing for booty, so they should be quite the sight. Then party on Mateys at the Party like a Pirate at the St. Peter's Lions Hall, with Ross Rankin and the Strawmen from 9:30pm to 1:30pm. During the party presentations for best dressed houses, pirates and pirate ships will take place. Must be 19 years and over to attend. There will be a silver & Gold collection at the door. On the last day of the festival, Pirates who might of partied a little to hardy and the rest of us land lovers can enjoy the Hangover Breakfast with great specials, at Louie's Cosy Corner from 8am to noon. Great way to shake off the barnacles. And from 2pm to 5pm it is Call to Muster Station where you can find your land legs again and support the Nicolas Denys Museum. There will be sweets, beverages and super entertainment with Evelyn MacRae & the Mainlanders as well as special guests at the St. Peter's Fire Hall. This is a fundraiser for the Nicolas Denys Museum, tickets are adults $10.00 and children $5.00. Come on out me pirate friends and support our local Museum. *Chubbys Lunch: Pirate Platter Special. *Jiggs: Deadman's Platter, Privateer Bounty, Rum & Raisin Ice Cream. 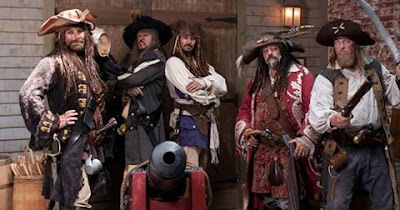 *Louie's Cosy Corner: 10% off for pirates dining in costume. *St. Peter's Marina: Berths for visiting pirate ships only $25.00 per night, call 902-535-2729. *Joyce's Motel & Cottages: $85.00 per night call 902-535-2404. * Cruise the Canal on Cuna Mara for $25.00 per person and children under 12 years free, for the 1.5 hr. cruise with Captain Gordon Kerr. Bookings at www.itsarap.com or by calling 902-631-3754. *Sail the Inland Sea on Misty Cat with guide and instructor Greg Silver. 25% off regular rates for groups of 4-6 in pirates costumes. Booking at www.capebretonsailing.com or call 902-631-5050.